A hospitalized Palestinian teen said Monday he was shot in his thighs by Israeli soldiers after he tried fleeing while he was handcuffed and blindfolded during clashes near the town of Tekoa, south of Bethlehem, last Thursday. The IDF said it was investigating the incident, which it said took place as Palestinian youths were throwing stones at Israeli soldiers. Osama Hajahjeh, 16, said he was trying to run from soldiers when he was shot. He said the incident began after a funeral for a school teacher in his village of Tekoa, who had been hit by a car driven by an Israeli while walking at a busy intersection. "I got confused" and stood up, he said. "Immediately, I was shot in my right leg. Then I tried to run, and I was shot in my left leg and fell on the ground," he said, speaking from his hospital bed in the West Bank town of Beit Jala south of Jerusalem. Doctors said he is in stable condition. The shooting set off a chaotic scene. Soldiers and Palestinians shouted at each other as the teen lay on the ground. One soldier took off the teen's belt and used it as a tourniquet to stop the bleeding. In a statement, the military said the teen had been arrested after participating in "massive stone throwing" at Israeli forces. 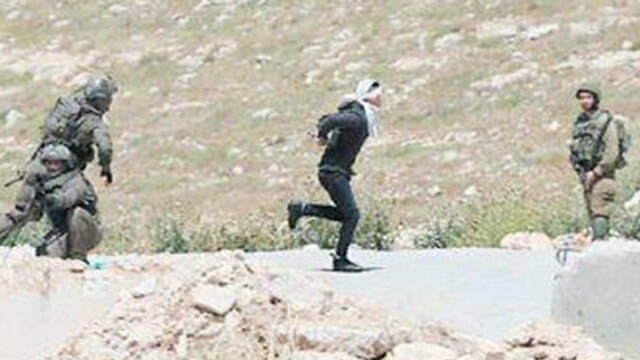 "The detainee was held at a nearby spot and began running away from the force. The soldiers chased him, during which they fired toward his lower abdomen," it said. Hajahjeh's father, Ali, said he was thankful a soldier gave his son medical care. But he said his son never should have been shot to begin with. "Only a sick person would shoot a blindfolded boy," he said. The Israeli human rights group B'Tselem said the incident was the latest in a series of what it called unjustified shootings on Palestinian teens and young men. It says four Palestinians in their late teens or early twenties have been killed in the West Bank since early March. B'Tselem has long criticized military investigations, saying they rarely result in punishments and alleging they're used to whitewash abuses by troops. "Like the previous four cases we investigated, this is an example of Israel's reckless use of lethal fire, and the fact that the human lives of Palestinians count very little in the eyes of the army," said Roy Yellin, a spokesman for the group. Israeli forces opened fire targeting Palestinian farmers and fishermen across the besieged Gaza Strip, on Monday morning. Israeli forces deployed in military watchtowers at the Sufa military site between the Rafah and Khan Younis districts, in the southern Gaza Strip, opened fire at Palestinian farmers working in the area. Additionally, Israeli forces also opened fire towards nearby Palestinian agricultural lands. 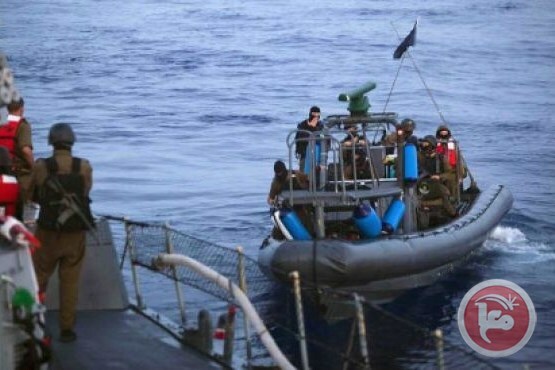 Meanwhile, Israeli naval boats opened fire targeting Palestinian fishermen off the coast of Rafah City, forcing them to head back to shore in fear for their lives. The Israeli police on Sunday evening raided a Palestinian hotel in Occupied Jerusalem and shut down an event set to be held there. Local sources said that the Israeli police stormed an event organized by al-Quds Holding Company and handed some of the audience interrogation orders. Israel prevents the organization of Palestinian events in Occupied Jerusalem and considers them a challenge to its attempts to Judaize the city completely. 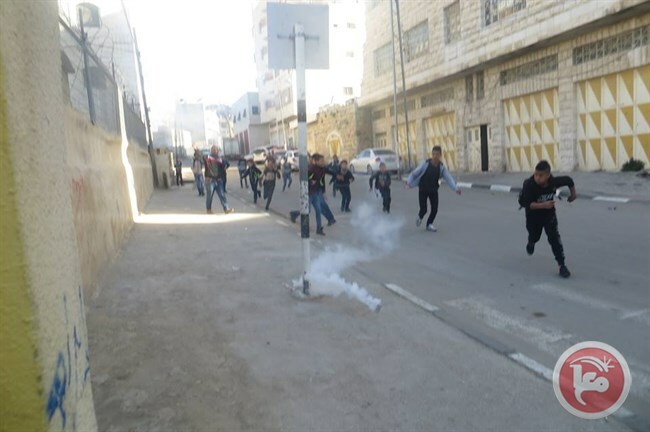 Dozens of Palestinian students and teachers on Sunday morning suffered from their exposure to tear gas fumes after Israeli soldiers attacked their school in the southern area of al-Khalil city in the occupied West Bank. Sources from the administration of al-Khalil elementary school said that Israeli soldiers showered students and teachers with tear gas grenades as they were entering the school in the morning. They said that many students and teachers received on-site medical assistance after they suffered from their exposure to tear gas. Palestinian schools in the southern area of al-Khalil are exposed to almost daily attacks by Israeli soldiers and settlers. 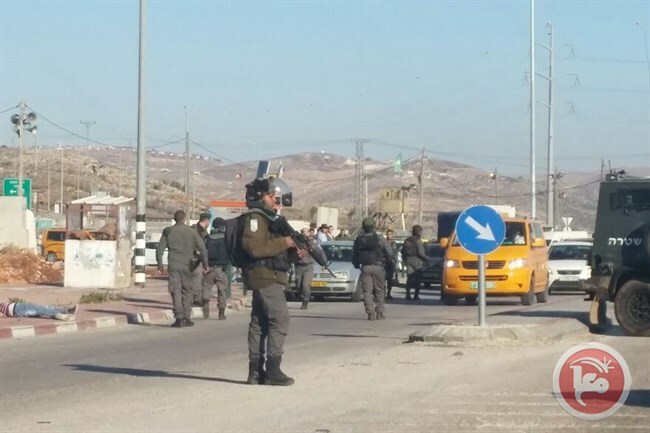 Witnesses told Ma'an that Israeli forces deployed at the checkpoint opened fire at a Palestinian who was passing by the checkpoint. 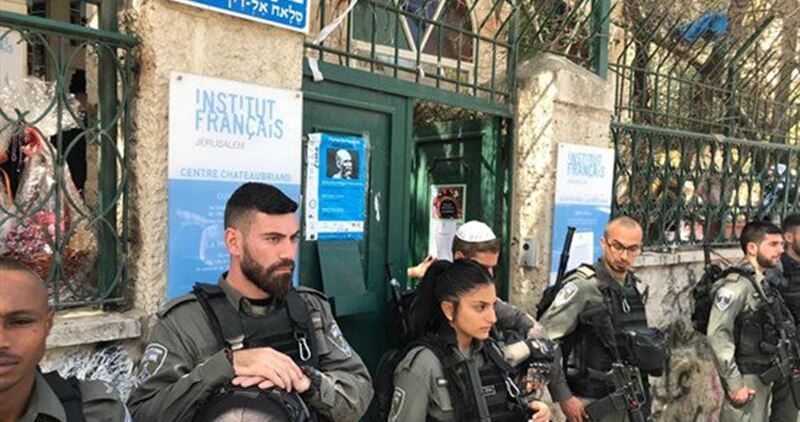 Israeli soldiers and police officers invaded, Friday, a wedding dinner party in the al-‘Isawiya village, in occupied Jerusalem, and detained the groom and his uncle. 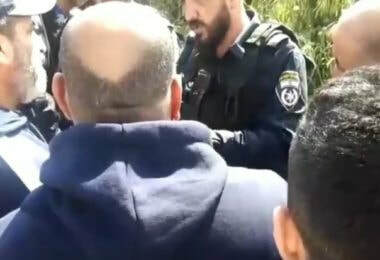 A video published by Wadi Hilweh Information Center in Silwan (Silwanic) on its Facebook page showed many officers invading the area and detaining the groom and his uncle. Silwanic stated that the soldiers invaded the party because of Palestinian flags that were raised there, and demanded their immediate removal. The soldiers then detained the groom and his uncle, and took them to a police station to sign an affidavit that all Palestinian flags will be removed, and no flags will be raised, or face imprisonment and high fines. The Palestinian Centre For Human Rights (PCHR): On Friday, 19 April 2019, in excessive use of force against peaceful protesters on the 55th Friday of the Great March of Return and Breaking the Siege, Israeli forces wounded 100 civilians, including 23 children, 5 women, 4 paramedics, and 4 journalists, in the eastern Gaza Strip. Two of those wounded sustained serious wounds. According to observations by PCHR’s fieldworkers, the Israeli forces who stationed in prone positions and in military jeeps along the fence with Israel continued to use excessive force against the protesters by firing bullets and tear gas canisters at them. As a result, dozens of the protesters were hit with bullets and teargas canisters without posing any imminent threat or danger to the life of soldiers. During this week, Israeli forces have escalated their attacks against the medical personnel in the field, wounding 4 members of them and targeting an ambulance belonging to the Palestine Red Crescent Society (PRCS) in eastern Khan Younis with a teargas canister directly while in field and evacuating those wounded. This indicates that there is an Israeli systematic policy to target the medical personnel and obstruct their humanitarian work that is guaranteed under the rules of the international humanitarian law. Hundreds of protesters, including children and women, gathered adjacent to the border fence with Israel in front of each encampment and its vicinity tens and hundreds of meters away from the fence. The protesters chanted slogans, raised flags, and in very limited incidents attempted to approach the border fence and throw stones at the Israeli forces. Although the protesters gathered in areas open to the Israeli snipers stationed on the top of the sand berms and military watchtowers and inside and behind the military jeeps, the Israeli forces fired live and rubber bullets in addition to a barrage of tear gas canisters. The Israeli shooting, which continued at around 19:00, resulted in the injury of 100 civilians, including 23 children, 5 women, 4 paramedics, and 4 journalists. Thirty-three of those wounded were hit with live bullets and shrapnel, 42 were directly hit with tear gas canisters and 13 were hit with rubber bullets. In addition, dozens of civilians suffered tear gas inhalation and seizures due to tear gas canisters that were fired by the Israeli forces from the military jeeps and riffles in the eastern Gaza Strip. Note: Among those wounded, 543 are in serious condition and 137 had their lower or upper limbs amputated; 123 lower-limb amputations, 14 upper-limb amputations, and 25 children had their limbs amputated according to the Ministry of Health. The number of those wounded only include those wounded with live bullets and directly hit with tear gas canisters, as there have been thousand others who suffered tear gas inhalation and sustained bruises. PCHR reiterates the reported published in February by the UN Commission of Inquiry which emphasizes what came by PCHR and other Palestinian and international human rights organizations. The report at the time concluded that the Israeli violations may amount to war crimes and crimes against humanity.